Hugh Jarrett died at age 78 in an Atlanta hospital on March 31, 2008. With his passing, another link to Elvis Presley’s spectacular career in the 1950s was lost. 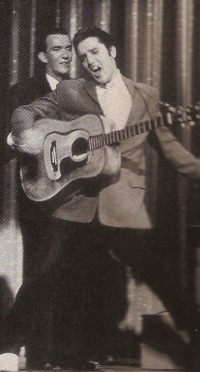 As a member of the Jordanaires, Jarrett sang bass on many of Elvis’s biggest hits of the fifties, including “Hound Dog,” “Don’t Be Cruel,” “Teddy Bear,” “Jailhouse Rock,” and “Hard Headed Woman.” With the other Jordanaires, Hugh backed Elvis in many of his 1956 TV appearances, including all the Sullivan shows. He also appeared in the Presley movies Jailhouse Rock and King Creole. In addition, Jarrett witnessed Presleymania first hand on stage with Elvis for over 75 concerts from mid-1956 through the end of 1957. Despite all these contributions to the Presley legend, Hugh Jarrett remained virtually unknown to most Elvis fans for many years. As a long time Elvis fan, I admit that I was unfamiliar with his name when I started the research for my Elvis ’57 book several years ago. But I soon learned that Hugh was one of the main players in the story I was trying to tell. Of the eight men on stage for all but one of Elvis’s 28 concerts in 1957, only four remained alive when I started my research in 2003. 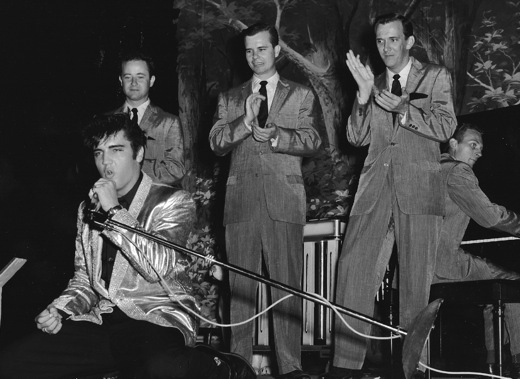 Elvis was gone, of course, as were bass player Bill Black and Jordanaires Hoyt Hawkins and Neal Matthews. That left just Scotty Moore, DJ Fontana, and the two surviving Jordanaires, Jarrett and Gordon Stoker, who could tell me what it was like during those boisterous Elvis concerts in 1957. I first established e-mail contact with Stoker, who got permission from Jarrett for me to call him. And so, when I called Hugh at his home outside Atlanta on August 24, 2003, he was expecting my call. From the start he was very eager to talk about Elvis and his experiences as a Jordanaire. He was one of those guys who talked a mile-a-minute; ask him a question and he’d go on for 10 minutes answering it. It was a good thing I was prepared to record the call. Of course, the first question I asked was if it was all right with him if I recorded the call. He paused a second, and then said, “OK, but let’s not make anybody look bad.” I assured him that as an Elvis fan, I intended to treat Elvis and all those who worked with him in 1957 with respect. When I was through with my questions, I got the feeling Hugh was a little disappointed. He was having a good time talking about those memorable years, and he wanted to keep going. By the summer of 2004, I had another set of questions for Hugh, and so I called him again. We had an even longer conversation that day, and I really felt like I was beginning to know him well. In another e-mail in 2004, Gordon further explained, “Hugh Jarrett was released from the group in 1958, so he is not included in any of the festivities relating to Elvis.” Hugh's biggest disappointment must have come in 2004, when the Jordanaires were inducted into the Country Music Hall of Fame. Jarrett did not go in with them. 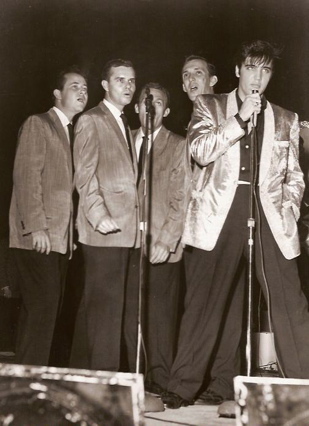 The lineup of Gordon Stoker, Hoyt Hawkins, Neal Matthews, and Ray Walker was honored, in a large part, for the group’s backing of Presley through the years. Jarrett was not inducted, nor even invited to the ceremony, despite the fact that it was he, not Walker, who sang bass during the most spectacular part of Elvis’s career. In my second conversation with Hugh, I asked him why he left the Jordanaires in 1958. I was just curious. The events my book covered ended in November 1957, months before Jarrett’s removal from the Jordanaires, so the reason for his departure was beyond the scope of Elvis ’57. Hugh answered quickly and briefly. “That was something personal. I’d rather not talk about it.” I left it at that. I will say, though, that I heard no bitterness in his voice at any time during our two phone conservations. "One time he made the statement, if there hadn’t been the Jordanaires, there wouldn’t be any Elvis. He obviously felt we added something to his performance."